This entry was posted in antiretrovirals, ASD, Cancer, CLL, GWI, HERV, Lyme Disease, ME/CFS, MS, MuLV, Neuroimmune Disease, retrovirus, vaccines, XMRV by Jamie. Bookmark the permalink. Who got us into the ME/CFS mess. Talk about forbidding inductive logic. There’s no such thing. There’s ME and there’s CFS. ME/CFS is a muddled mess that means whatever anyone wants and different things to different people. Not way to tell how/what patients were selected or what they have. And research results will be meaningless. Some results look good, some look bad. Will not replicate, thus no progress. Sound familiar? Patients play this game at their own peril. We call it out and demand more or nothing will EVER change. Jill, I understand that this point is near and dear to your heart. I don’t really understand your 2nd and 3rd sentences or what exactly you are implying I have or haven’t done. However, I’ll respond by saying that I think you are incorrect that there exists a distinct patient group that deserves to be called ME and something else that encompasses all waste basket diagnoses of people who aren’t really sick. You are doing to them what has been done to you. The artificial division you are making simply does not exist in the real world. I am evaluating and treating real patients. It is a continuum, not discrete groups. The disease has stages, so some of these people you want to exclude are early stage patients. Any division you can come up with is artificial. Whatever you call it, there are a bunch of symptoms, the order of prominence of those symptoms varies from patient to patient and not everybody has all of them, but the presence or absence of a particular symptom doesn’t make me think a patient has a different disease. I understand why it matters to you as an advocate, but it is clinically meaningless. I agree completely with you, Jamie. Jill, I can fit myself into at least 3 categories, no 4. I have Lyme disease, I have CFS, I have ME, and if I want to get some Lyrica I have fibromyalgia. I also have Hashimoto’s and have very bad reactions to mold toxins. So put me in a study and see what turns up. Assuming all of the above are different disease states then once we test for a lot of crap the groups will form naturally. Until we do this we have no clearcut groups. I keep looking for Fallon’s study of spinal fluid proteins that were different in CFS vs Lyme patients. Oh how we need to form these groups and then figure out why the proteins are different. Medical history throws many curious details. “Medical history was made in 1927 when Stokes, Bauer, and Hudson infected rhesus monkeys with blood from Asibi, a native of the Gold Coast (now Ghana) with a mild attack of yellow fever. The Asibi strain proved not to be benign and several deaths in laboratory workers were subsequently attributed to it. Nevertheless, it was the strain of yellow fever virus that between 1933 and 1937 Theiler, Lloyd, Smith and coworkers attenuated by multiple passage in mouse brain and chick embryo tissue. “Also working at Lederle was Polish-born virologist and immunologist Hilary Koprowski, who claims to have created the first successful polio vaccine, in 1950. Koprowski’s attenuated vaccine was prepared by successive passages through the brains of Swiss albino mice. Many papers about infected cell lines. Detection of murine leukemia virus in the Epstein-Barr virus-positive human B-cell line JY, using a computational RNA-Seq-based exogenous agent detection pipeline, PARSES. Infection of human cells by an endogenous retrovirus of pigs. Thank you Jamie, still coming to terms with the news I received yesterday that I am Lyme posative. Thanks for this article Dr. Jamie ! From my travels and communications I have the impression that people in developed, advanced countries get ME/CFS more often. Does anyone have any thoughts on why this might be the case ? Thank you for this passionate & informative post, Jamie. Great song choice too Jamie, I Love Stevie! I am not however happy about what’s happened to my family! And mine is not the only one. 14 months on bio-identical Estriol 20 mg/Progesterone 50 mg , with every month continuing to bring improvements. This was mentioned in a comment on this blog. Do take many supplements, including ribose = key to hypothalamus function. A German MD doing clinical research in the USA (links below) has documented that WiFi ( pulsed microwave radiation) splinters both the genome, and the mature DNA / mitochondria . And that WiFi induces , in severity directly proportional to exposure , all of the spiking organism failures like MS, Autism, Parkinsons, Alzheimers, Diabetes Type 3 , Lupus, ME…AD INFINITUM. Jamie, will you please at least get the above correct? When you make such fundamental errors it really detracts from the rest of your argument since it makes it look like you have absolutely no grasp of what is being discussed. 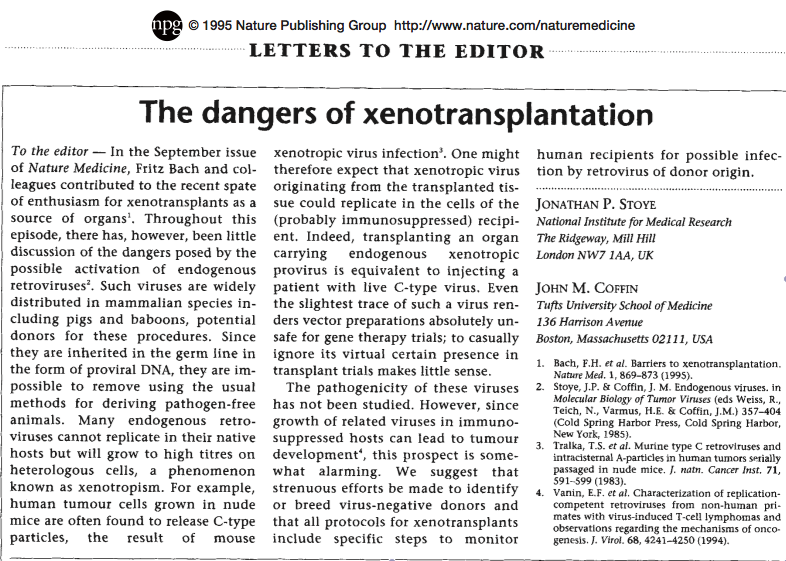 The “vanishingly small” chances referred to in the ‘Recombinant Origin of the Retrovirus XMRV’ paper have absolutely nothing whatsoever to do with there being a ‘vanishingly small’ chance of XMRV itself being produced, or even any number of XMRV-like/type viruses being produced. The ‘vanishingly small’ reference is in regards to there being a ‘vanishingly small’ chance that a virus which was 100% identical to XMRV being produced twice in seperate recombination events. This led the authors to conclude that since the chances were so ‘vanishingly small’ for an identical (not similar, not related, but 100% identical) retrovirus to be produced twice in independent recombination events, it was indeed the case that the virus known as XMRV was produced in the manner in which they described in the paper and not produced once in a lab rat and once again in another seperate and completely unrelated event, ie ‘out in the wild’. I’ve tried explaining this before, but ‘vanishingly small’ has absolutely nothing whatsover to do with any number of recombinant retroviruses being produced in the manner in which you hypothesize, but rather has to do with the potential for two (or more) 100% identical recombinant retroviruses being produced in seperate and unrelated recombination events. You and others are and have been completely misinterpreting what was said for quite some time and it makes you look foolish to keep doing so. You have missed the point, John. Focusing only on XMRV, while ignoring the broader implications, is a form of obfuscation. That’s because the paper you cite was on the origin of XMRV, hence the title ‘Recombinant Origin of the Retrovirus XMRV’. Please re-read this sentence- “So they are finally admitting that the chances aren’t so small, since there have been so many chances. Now there are two. Or is it three?” I thought you might have understood but your statements contradict themselves. They never said the chances of similar recombinant retroviruses occuring were small to begin with, did they? Any given paper cannot touch on every single aspect of a given situation, it can only deal with the topic that the paper was written to deal with. As the current paper shows, the authors are not ignoring the broader implications, they’re simply describing what has been shown by their work and are in fact actively working to broaden the research base on the subject. I don’t have a problem with your basic argument, I’ve just seen the ‘vanishingly small’ thing repeated fairly recently (oddly enough by someone who also was a big bugaboo during the whole XMRV fiasco and who would spin scary tales to the chirruns by the campfire) and wanted to clarify the subject. This is the actual quote from the Paprokta paper. The other way of looking at this concusion is that it was the product of the authors belief that XMRV was created by these recombinant events. The chances of that actually being true in the first place had the same odds as having it happen again, i.e. vanishingly small. And as I pointed out they failed to demonstrate that their quantitative PCR could detect XMRV nucleic acid below a concentration of 2000 copies per 100 cells. So the results are open to interpretation. One can either conclude that the results were a product of an unvalidated PCR of unknown clinical sensitivity which could not detect GRV DNA in early xenografts, or, evidence of an astronomically unlikely series of recombination events. This is what I’m talking about- when you say that “The chances of that actually being true in the first place had the same odds as having it happen again, i.e. vanishingly small”, this is completely incorrect and shows your lack of even the most basic understanding of the subject. For a given recombination event to occur once is no big deal, however for the exact same recombination event to happen twice is vanishingly small, which is why the authors write “Because the probability that the same recombination event could occur independently by random chance is essentially negligible…”. Think of it like two individuals having a child together- it’s really not that uncommon. But the chances of the same individuals having the exact same child twice as a result of seperate fertilization events are vanishingly small, even though all of the same genes are present. Actually that it not correct and they failed to demonstrate that their quantitative PCR could detect XMRV nucleic acid below a concentration of 2000 copies per 100 cells. From that point any conclusion the authors made is purely speculation. XMRV is the name given to 1 sequence. Other gamma retroviruses are not XMRV. Which means there is evidence for other gamma retroviruses in ME, not THE sequence they call XMRV. Jamie, I have been ruminating over the sugar cube polio live vaccine I got. I am 67 and got the polio shot around 1955. Then in January, 1957 we moved to Philadelphia. While I attended a private grade school there I was given the sugar cube. That had to have been no later than the spring of 1959. A local doctor who had a daughter in our school came in and gave all of us that sugar cube which does not seem to have been on the market yet. I wonder if that doc was part of a clinical trial group related to Kaprosky at the Wistar Institute? I can’t see how else I got that live vaccine. Of course, I have to add that I have no clue if this has any relevance to my developing CFS many years later at the age of 50. I just find it curious. I have no other way to publish this. I am no longer on forums, nor FB or any other social forum, because I have been hacked and cyber stalked for month – I am to sick to take such crap -, but I continue to study, and what I found is important and will interest you very much. So excuse me if I use this avenue to get the word out. Several important studies on immunological abnormalities in patients diagnosed with ME/CFS have been published: two studies from Australia (Brenu et al. ), China (LIU Ding-hua)﻿ and now another study from Spain. About six month ago I showed the papers from Brenu et al. to a cancer doctor and asked her what she is thinking about it? She took one look at it and commented ” similar immune markers are found in many cancers”. One thing led to the next and I found myself studying cancer-immune research. I started out with cancer research and ended up with infectious diseases. A pretty amazing journey and if you bear with me I am sure you will find this write up an eye opener. I am not a scientist nor doctor and I am sure there are others in our community including our specialists better qualified to talk on this topic in detail, but it seems to me nobody is talking about it. WHY? I will try to summarize what I found and learned (quote a few texts to make it easier for me) and attach a some interesting studies which I think are relevant. Lets back track a bit and just compare what three studies found. If you compare all three studies there are differences in their finding’s and some results seem to contradict each other or are just to complex to discuss here in details, especially as a layman patient, but there is some remarkable overlap in all three studies which must change how you, and the science community, views ME/CFS. All three studies have found a significant increase of Tregs! In order to understand the significance of this findings one has to acquire some basic knowledge about immune markers. T cell is a lymphocyte of a type produced or processed by the thymus gland and actively participating in the immune response. Also called T lymphocyte. B cells are a lymphocytes not processed by the thymus gland, and responsible for producing antibodies. The CD system is used as cell markers in immunophenotyping and they are usually grouped, called cluster of differentiation (cluster of designation), associated with certain immune functions. Cluster of differentiation can aid in a diagnosis and monitor disease progression/regression in clinical trials. For example in cancer they are used to monitor the effectiveness of therapies, or the progression of cancer. Another marker well known is the CD4 marker in HIV – CD4 and CD8 cells are used to monitor the progression in HIV infection. Alteration in the number and function of Tregs has also been implicated in several autoimmune diseases, including MS, RA and type 1 Diabetes. But Tregs in autoimmune disease are usually decreased, exempt in virus induced autoimmune models, and upregulation is considered to prevent autoimmunity. The ability of various therapies to regulate the differentiation and function of Treg cells in autoimmune or allergic diseases has been the subject of many recent studies. It deserves a separate write up, but here a few excerpts. Interestingly, regulatory T-cell activity has also been reported to increase in several infectious﻿ contexts, such as retro-viral infections, mycobacterial﻿ ﻿infections, various parasitic infections including﻿ Leishmania and Malaria. Various studies explain the mechanism by which (FV) viruses seem to manipulate Tregs, cause CD8+ T cell disfunction and impair virus clearance causing chronic low grade infections. If I understood this correctly, a mechanism which does not only fit into the findings of a low CD8+ activity in two studies (Spanish/Australien Study), but it fits the pathology of ME/CFS like a glove. “In acute, self-limited virus infections, a vigorous CD8 T-cell response leads to viral clearance. However, many viruses induce persistent infections, despite continuous measurable CD8 T-cell responses (103), a situation in which Treg may be involved. Although Treg activity could be beneficial to the host due to a suppression of tissue damage mediated by virus-specific effector T cells, those T cells simultaneously inhibit the host immunity important for viral clearance and thus may contribute to persistent infection. Yasmine Belkaid&Barry T Rouse’s review put the nail in the coffin for ME – so to speak. They discuss the control exerted by natural CD4+CD25+ regulatory T cells during infectious process. High Tregs are markers all three studies can agree on. Regulatory T cells play an important role in maintaining immune homeostasis. High levels of Tregs have been found in many cancers and various viral context. High Tregs are known to cause immune suppression and could explain many of the other immune abnormalities, and thus explain the inability to clear chronic infections. I hope I could convey to everyone the significance of these immune markers. We all agree that CFS is nothing else than a convenient waste bucket classification, with severe consequences for us patients. In my view the diagnosis of ME as primary neurological is also questionable, especially considering those immune abnormalities and the history of ME. That NK cells activity is “skewed” in ME/CFS patients is no news and many are familiar with the topic. But NK cells consist of subgroups and add to the complexity of the immune disfunction in various immune diseases. Cancer research has gained new insights into their functions and purpose in normal immune surveillance of NK cells, and developed therapies to eliminate tumor cells through monoclonal antibodies like Rituximab – a topic which should be of interest to us.